The world’s first 8K broadcast deck with advanced H.265 recording, touch screen interface, internal cache, built in scopes, HDR, traditional deck control and more! Blackmagic Design announced HyperDeck Extreme 8K HDR a new innovative broadcast deck with advanced H.265 8K recording combined with touch screen user interface and traditional broadcast deck controls. HyperDeck Extreme 8K HDR will be available in June 2019 from Blackmagic Design resellers worldwide for US$4995. HyperDeck Extreme has an innovative touch screen user interface with deck controls as well as a large screen to view their recording. Then add a HyperDeck Extreme Control for traditional broadcast deck controls and a large shuttle knob that feels incredibly luxurious to use. Customers can even rack mount the HyperDeck and the controller. HyperDeck Extreme also includes 2 media slots, Quad 12G-SDI for 8K, analog connections for archiving, USB-C external disk recording, plus a front panel speaker and headphone jack. There’s also an optional cache that eliminates dropped frames if their media becomes full or is too slow. Both AC and DC power connections are also included for studio or on location use. HyperDeck Extreme Control extends their HyperDeck Extreme to add traditional broadcast deck controls. It works like a traditional broadcast deck with a familiar layout. Customers can control up to 8 decks via industry standard RS-422 control. Customers can even rack mount to the HyperDeck Extreme to create a single “broadcast deck” unit. Because it uses standard RS-422, customers can control old broadcast decks and perform edits using set in and out points. That’s perfect for archiving work. Plus customers can even edit between frame rates if standards converting between formats. HyperDeck Extreme 8K features a wide range of video and audio connections such as multi-rate Quad Link 12G-SDI for SD, HD, Ultra HD and 8K SDI devices. The 12G-SDI outputs support fill and key when playing RGBA 4:4:4:4 files. HDMI is included for consumer televisions and video projectors. For archiving work, HyperDeck also includes both balanced analog, HiFi audio plus timecode connections. For monitoring there’s even a down converted monitor SDI output that includes overlays. The latest 10G Ethernet is included for high speed upload using FTP protocols. 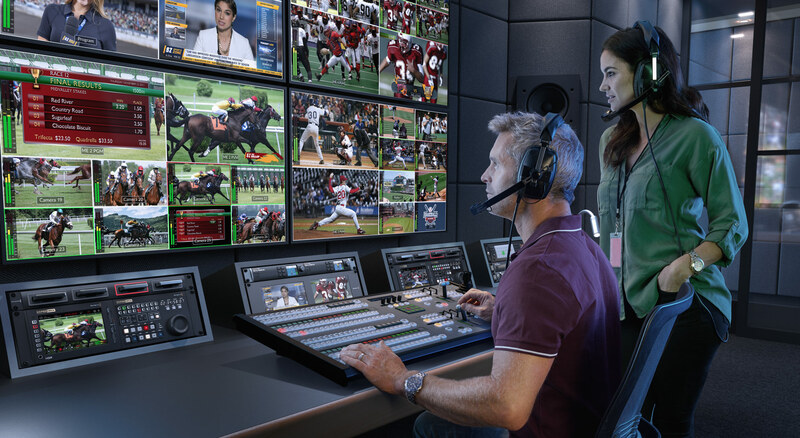 There’s a wide range of Blackmagic Design products customers can use with HyperDeck Extreme, including the HyperDeck Extreme Control for adding traditional broadcast deck controls. Plus it uses the industry standard RS-422 deck control protocol so it works with any broadcast deck. It’s possible to add the new Blackmagic MultiDock 10G to use regular SSDs for compatibility with media from other HyperDeck models. HyperDeck Extreme 8K is also a perfect mastering recorder with the new ATEM Constellation 8K, or for clip playback and ISO reordering. For monitoring, the Teranex SDI to HDMI 8K allows broadcast monitoring on a television and it also has monitor calibration, 3D LUTs and on screen scopes. Product photos of the HyperDeck Extreme 8K HDR, as well as all other Blackmagic Design products, are available at www.blackmagicdesign.com/media/images.